One of the most brilliant, well-written pieces I have read about the economy is "The Wrong Tree" (as in "Barking up the ..."). Written by Jerry Mander of the International Forum on Globalization, it is found as part of the introduction to the the latest publication of peak oil sage Richard Heinberg. 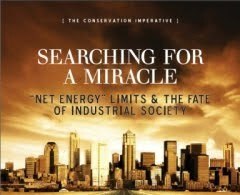 First, about Heinberg: Richard Heinberg 's Searching for a Miracle: 'Net Energy' Limits and the Fate of Industrialized Society is a serious analysis of just about every form of alternative energy and its potential (read: lack of potential) to fulfill our energy demands as we devour the declining second half of our planetary oil supply. If you are a stranger to the weaknesses inherent in alternative energy, I highly recommend Heinberg's rather technical publication. I also recommend this short article. Heinberg's section "Transition Plans" (page 61 of the document, page 68 of the pdf) is good, albeit short. It does mention the Transition movement in a brief nod, which is notable given Heinberg's previously expressed opinions. But I do trust that Heinberg is coming around. You can download Heinberg's publication as a free pdf via the link at the base of the posting here (pdf 2.6MB). But back to Jerry Mander: "The Wrong Tree" (page 2 of the Heinberg document, page 9 of the pdf) explains why the economy is not recovering, and why it won't recover. In the incredibly brief space of one page, Mander hits such issues as: operating on the wrong assumptions, resource limitations, the scale of denial, and the need for fundamental systemic change. It might leave you breathless. Certainly there are full-length works on this topic, but I have not found such a well-worded, comprehensive, conclusive, irrefutable, brief explanation. In our Training for Transition we were introduced to the decline of the Industrial Growth Complex, but the explanation was leaden and at times vague. Mander is clear and searing. If anyone questions you about the economy, point them to Mander's piece. And then be prepared to collect the reader's staggering form. Perhaps Rob Hopkins' "Coping with Your 'End of Suburbia Moment' " (page 83 of the Transition Handbook) should be included in fine print after Mander's piece.